Spring in Idaho involves all kinds of weather. April at Dog Bark Park has seen snow, been warm as summer, rained plenty, & also was just plain lovely with pleasant sunny days. These red/orange tulips are especially shocking on recent overcast days. Their color shouts out for attention. A few daffodils are the only other flowers in bloom right now. Soon tulips will be showing their red and pink colors. And we always welcome the tiny white or pink blossoms of our honeysuckle shrubs. One small lilac bush will flower at about the same time. Ah, spring! 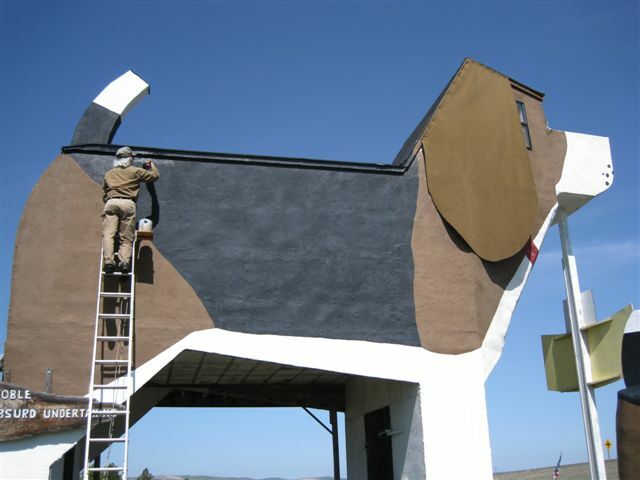 On one of the summer-like days last week, Dennis was able to begin re-painting the big beagle. He’s on a 20 foot ladder and will definetely not be there when the prairie winds are a’blowing. In this photo he’s just finishing the dog’s black saddle. This is the first entire re-do of the dog’s coat since the original painting ten years ago. If time & the weather allows we plan to have the entire beagle refreshed before Fall arrives. With one ladder and one gent it is not a quick weekend task that’s for sure. I do plan to help paint the lower sections. One would think, after spending a few summers on high forest fire lookouts in the mountains, heights would not bother me….but that was a long time ago & time has a way of changing us! 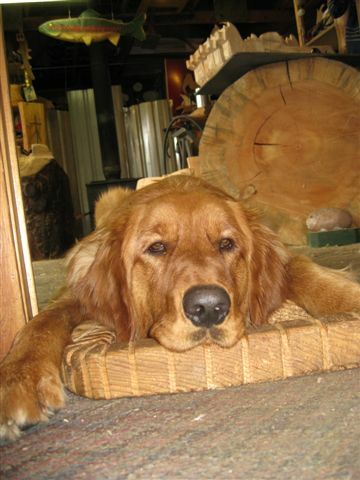 Mr. Sprocket, our golden retriever Dog Bark Park Ambassador-in-Training, takes a beauty rest from time to time while on the job. 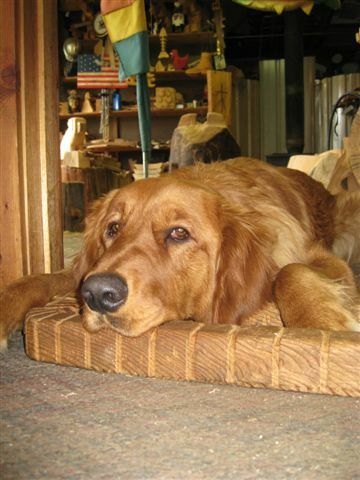 It is his primary task to greet visitors at his wooden gate in the entryway between our office/giftshop and our carving studio behind him. He will not cross the low wooden carving, usually standing there wagging his tail in an attempt to get visitors to step closer so he can receive proper greetings from them. After that, and particularly when conversations between humans get too lengthy for his canine attention span, he’ll do just this – relax and take a snooze.